Most used for replacing BA15S halogen bulbs. Suitable for a wide range of 12V DC applications, including indicator lighting, automotive rear/back-up/turning signal/tail lighting. Low power consumption and long life span can save you a lot. 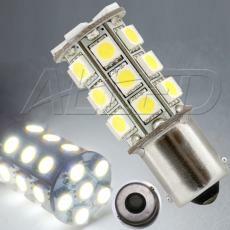 With a standard BA15S connector, you can easily detach the origninal halogen bulb, then plug it directly onto the lamp holder.